We test for Radon according to EPA standards required for real estate transactions. The laboratory results of those test are provided to our clients within 72 hours of completion of the radon inspection. These tests are a minimum of 48 hours and do require that “Closed Building Conditions” be maintained in the home for the duration of the radon testing period (and 12 hours prior if only 48 hours of data is to be collected). All radon gas inspections, reports and test results are for the use of our clients only. Radon is a radioactive gas that has no smell, taste or color. Radon gas is produced by decaying uranium found in nearly all soil and rock, including the dirt and soil that is in your crawlspace, under your basement slab and surrounding your home’s foundation walls. As a gas, Radon moves slowly through concrete and concrete block walls, more quickly through uncovered soil in crawlspaces, and becomes most harmful when accumulated in these enclosed spaces. Radon can be measured outdoors at average levels around 1.2 pCi/l and as high as 2,000 pCi/l indoors. When indoor levels are measured after Radon testing at 4 pCi/l the Environment Protection Agency recommends action be taken to reduce the volume of radon gas found in home. Health authorities like the Centers for Disease Control (CDC), the Surgeon General, the American Lung Association, the American Medical Association, and others agree that we know enough now to recommend radon testing in Nashville and to encourage public action when levels are above 4 pCi/L. Radon gas is unstable, sending radioactive products out into the air as it decays. Those radioactive products can attach themselves to dust in the air turning the dust into carcinogens. When those carcinogens are inhaled, becoming trapped in the sensitive lung tissue, they release radioactive particles that travel only a short distance with high energy, wounding these cells they come in contact with. When enough of these energized particles are released on cells, wounding them over and over again, the DNA chain can be penetrated and broken, altering the DNA makeup of all cells that continue to split from that ‘broken’ or mutated/cancerous cell. The Surgeon General warns that Radon gas is the second-leading cause of lung cancer in the United States. Breathing this radioactive gas over prolonged periods is a significant health risk to families all over the country. Magnolia Property Consultants, LLC provides Radon inspection and Radon Testing services to measure indoor levels of Radon in Nashville homes. High radon levels have been found in every state. Radon problems do vary from area to area, but the only way to know for sure if your Nashville home’s Radon level is to schedule a Radon inspection. Inhalation of Radon gas decay products increases the risk of getting lung cancer. Your chances of getting lung cancer from Radon gas depend on factors such as the home’s radon level, the amount of time you spend in your home and whether you are a smoker or have ever been a smoker. Recent studies estimate that between 15,400 and 21,800 deaths per year are attributable to Radon gas. Radon causes lung cancer in smokers and non-smokers. Read more here on a study by Dr. William Field on radon-related lung cancer in women. Magnolia currently uses the passive method certified by the U.S. Environmental Protection Agency for real estate transactions. The Radon tests are left at the property for 48-80 hours and then shipped to the lab for analysis and action recommendation. Magnolia shares those full testing results solely with its clients, these results are usually available within 7 days of placement of the testing equipment. 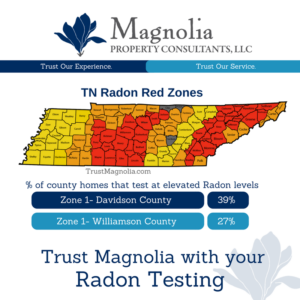 Magnolia is responsible for informing the current Nashville homeowner of the Radon testing procedure, including keeping all windows and outside doors closed, as much as possible, 12 hours prior to and during the test period. Magnolia is responsible for retrieving the tests, sending the test to the lab and informing our clients of the results. We do not share this test results with anyone other than our clients. ARE THERE WAYS OF LOWERING THE RADON LEVELS IN THE HOME? If your Radon inspection uncovers that you have high Radon gas levels, there are ways to reduce those levels below 4pCi/l. It is better to correct the presence of high levels of Radon gas before placing your home on the market. Radon mitigation professionals specialize in the performance of systems that reduce Radon gas levels, customized to your specific home needs. Magnolia Property Consultants, LLC does not install the mitigation systems.